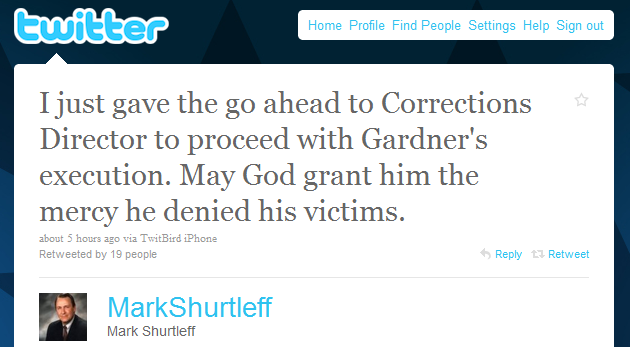 A sign of the times, although many may find it distasteful, or much worse: Utah Attorney General Mark Shurtleff used a mobile Twitter client to send out a tweet announcing the impending execution by firing squad of convicted murderer Ronnie Lee Gardner. As the BBC notes, quite a modern way to announce a very old-fashioned death. In total, the AG sent out 3 tweets about the event from his iPhone only a couple of hours ago, the most recent one an all-too-familiar (on Twitter) self-promoting one. 2) I just gave the go ahead to Corrections Director to proceed with Gardner’s execution. May God grant him the mercy he denied his victims. We’d love to hear your thoughts on this in comments.